Well, it's official! 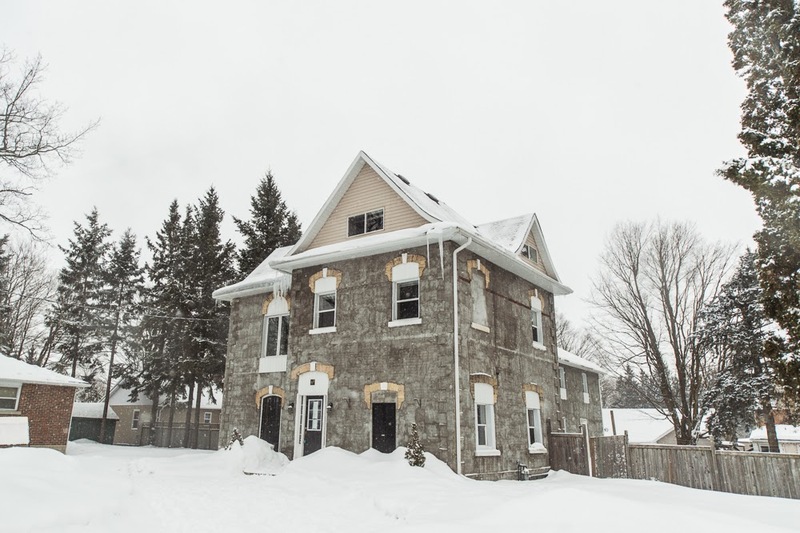 My husband Scott and I are beginning the journey of restoring a home more than a century old. The home needs a lot of TLC, but we are in love. We are set to get the keys March 28th and if all goes well, will be moved in by the following weekend. This home restoration requires vision more than anything else (okay, other than money...lol). Scott and I, although young, have fallen in love with so many things from the days of old. I watch classic movies and feast my eyes upon ornate trimwork and beautiful antique furnishings. I scan Pinterest daily for rooms with character and history. Scott sits on youtube watching tutorials for things like "coffered ceilings" just for kicks. We love this stuff. It's what we dream about (literally) and often what we are talking about. There will certainly be a few years where we won't have all the finances we need to do what we want, but where we lack the money we certainly don't lack the vision and commitment. So with some patience and lots of dedication, we look forward to bringing our vision for this home to fruition! These past few days it's really hit me more and more what we are getting ourselves into. There is a lot of uncertainty and change. We are moving from a very convenient set-up to a very inconvenient one. The home we just sold is a condo corp townhome which means we paid condo fees to have the exterior and yard taken care of by landscapers. We were also the first owners and everything was brand new. Nothing broke, leaked, smelled funky, or needed work. We live in a very convenient neighbourhood with all the possible ammenities we could need just steps from our front door. However, as young adults we both always felt like we were cheating at being homeowners. We feel like that kind of living should be left for the geriatric not the young and abled. Yes, we have become accustomed to that living and I am sure we are in for quite the wake-up call but I believe this is what we need to continue growing into adulthood. We need a challenge. We need to develop practical problem solving skills and home making skills. We need to reap what we sow but more importantly, we need to learn how to sow (and I also plan to learn to SEW too...haha). We are moving to a small town with a whole lotta nothing to do which means we will have a lot of time to think and learn and grow as we work on this home together. I am really excited for this new adventure. We are stepping out pretty far on faith alone but it feels good! For all the time we are spending dreaming, we are trying to be equally practical by assessing real costs and real needs that are going to be more demanding than others. For example, we really want a wrap around porch and deck, but we know we need to do a bazillion other things first. We are going to learn a lot about not being indulgent....or at least not being indulgent until all the needs are met and then we can move onto wants. So first things first, we need to re-do the attic insulation before next winter. 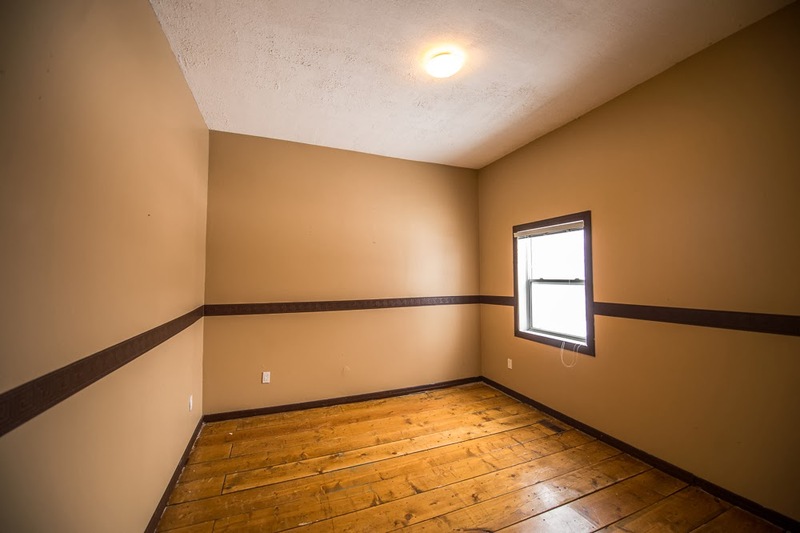 This will be costly as we will be definitely going with rodent-proof spray foam insulation but this will be one of the most worthwhile investments we put into this home. After the inspection, we learned we were losing a ridiculous amount of heat because the insulation was chewed through by mice in the attics. This heat loss has also created another problem - ice buildup. The ice on the roof is out of hand this year and the plan by next year is to be as icicle free as possible! We are hoping and praying this ice build up doesn't cause any major water leakage at the thaw (JUST in time for our move-in...lol) but the silver lining is that Scott is planning to rip out so many walls anyway, that leaks at this time would really not be the headache that they normally would be since nothing is finished and staying in terms of walls/ceilings/doors/trim anyway. It's actually a good thing the original trim work is not still in tact, as working around it and trying to preserve it would be difficult when we have so much work we need to do inside the walls. Now we feel guilt-free taking a sledgehammer to this house because all we can do is improve the character from here! I figured I would post some before shots to give a bit of an introduction. 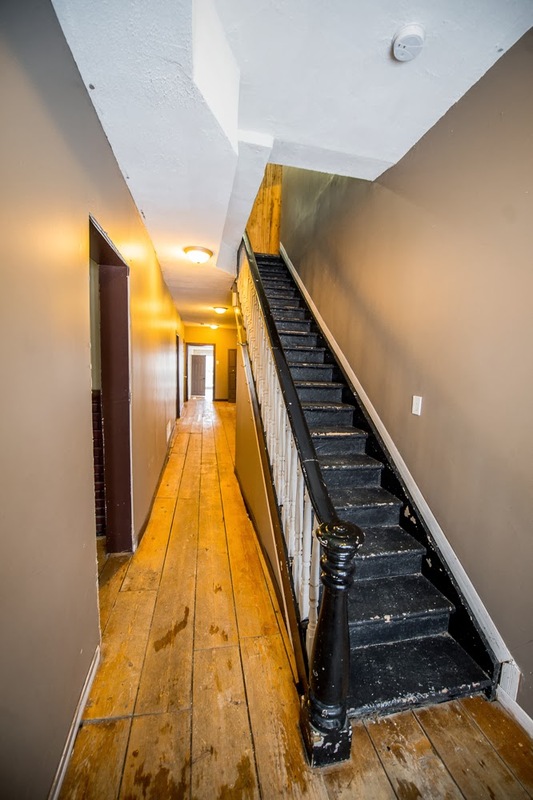 Eventually I will do posts room by room with plans for future renos but here's a little walk through to get things started! Here is the streetview shot from Google Maps during the summer. The driveway is really unique for in town. It is in a semi-circle shape so there are two access spots from the street and then it also runs back along the leftside of the house to the back entrance/shed. One window on the right side of the house has been closed in...so we plan to add a window there again since that looks super silly! 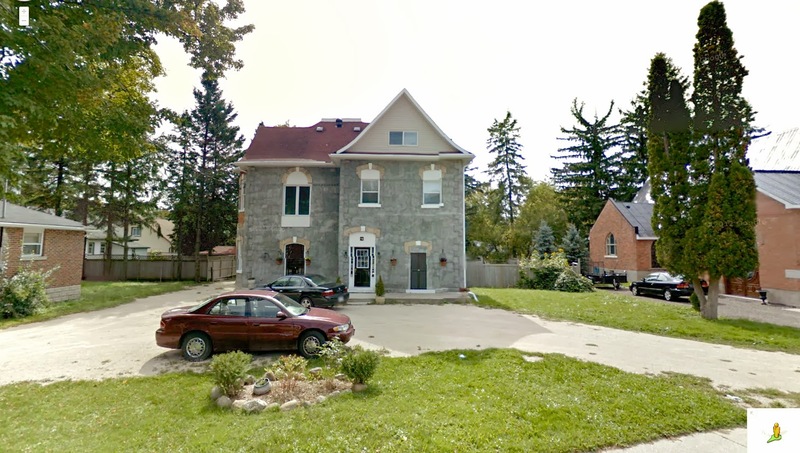 You can also see in the far back that the house goes back farther than you can first see from the road - there is an addition on the back with a second story 2 bedroom apartment with a full kitchen and full bath and a separate entrance. 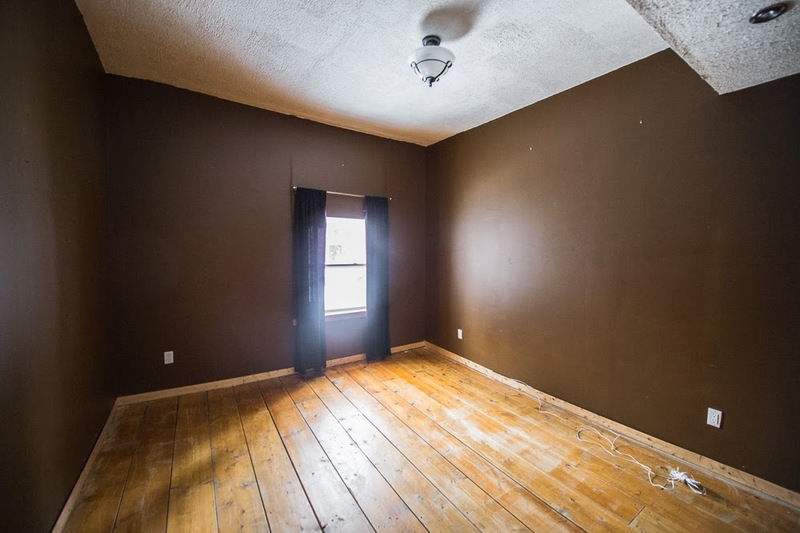 We figure we can rent that out to help pay for our renos. Looking out from the master bedroom to the driveway. This is looking from the dining room into the livingroom, which faces the front of the house. 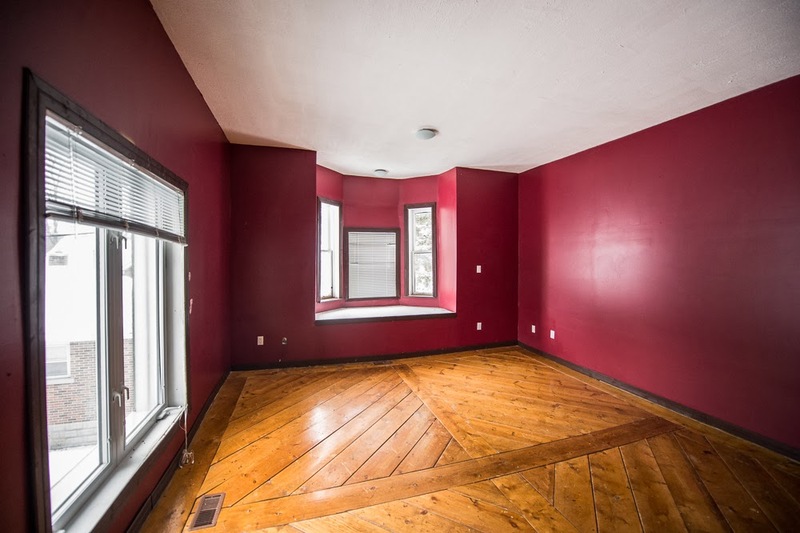 There is a window seat with a stained glass window on the right and what was once a working wood fireplace on the left. 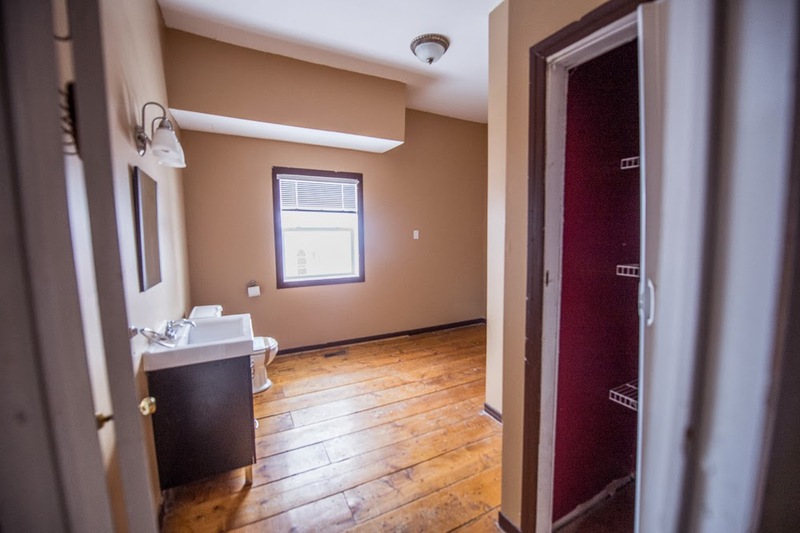 Also, right between the two rooms are some cool shabby black pocket doors which I am excited about. Another angle stepped back now into the dining room a bit. The front entrance and long hallway...so much to be said, not enough time. 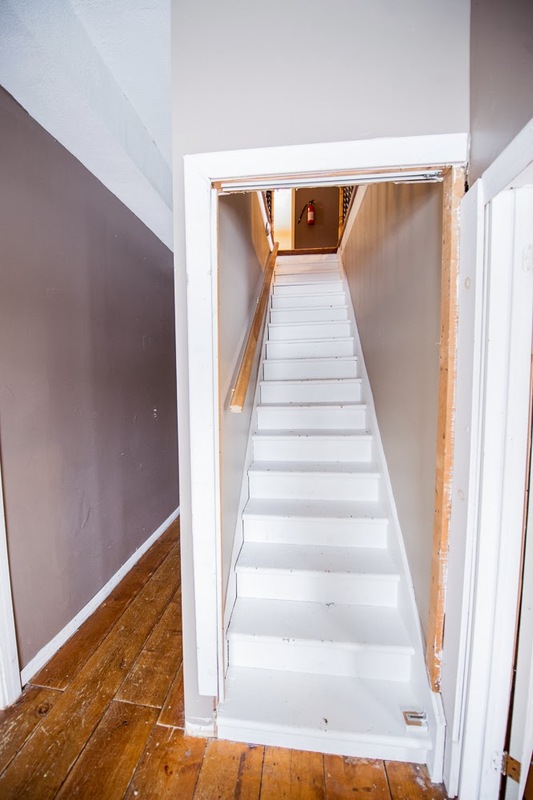 The stairs are *old*. For now we are gonna sand them and paint them. I love the black and white but the risers need to be white instead of black so that will be happening right away. You can see here how terrrrrrible/non-existent the trim work is. But back to the layout - just outside of this frame to the front right is an office. On the right after the stairs is the room posted in the next photo. 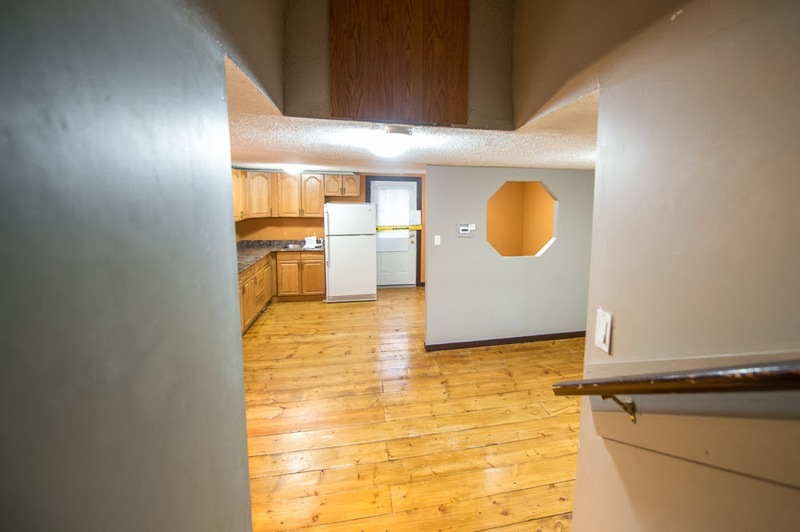 On this floor we also have a walk in pantry and a full bath. What will be the library. Here is the main kitchen. We are short a lot of cupboard space but we have some ideas for the short term and eventually this will all be redone. 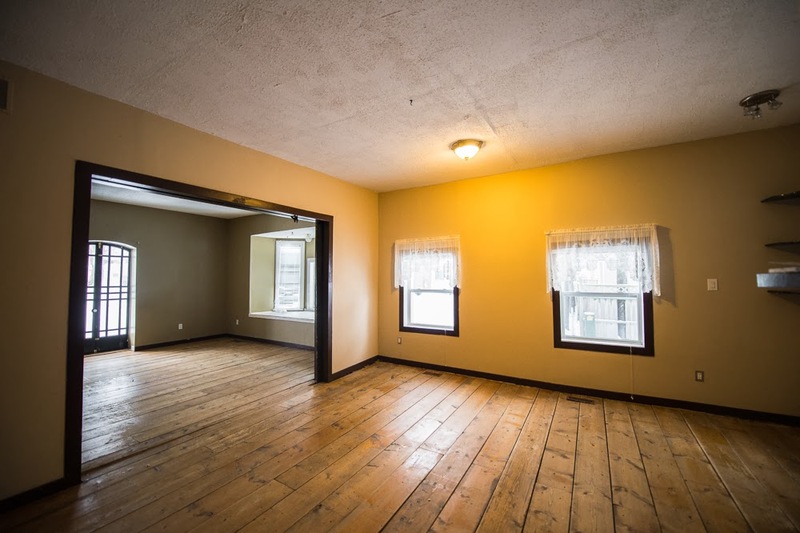 We are excited that it's spacious with lots of light - which gives it lots of potential! That is the slidding patio door in the back. I love the doggy door on the right which goes to our fenced in side yard. 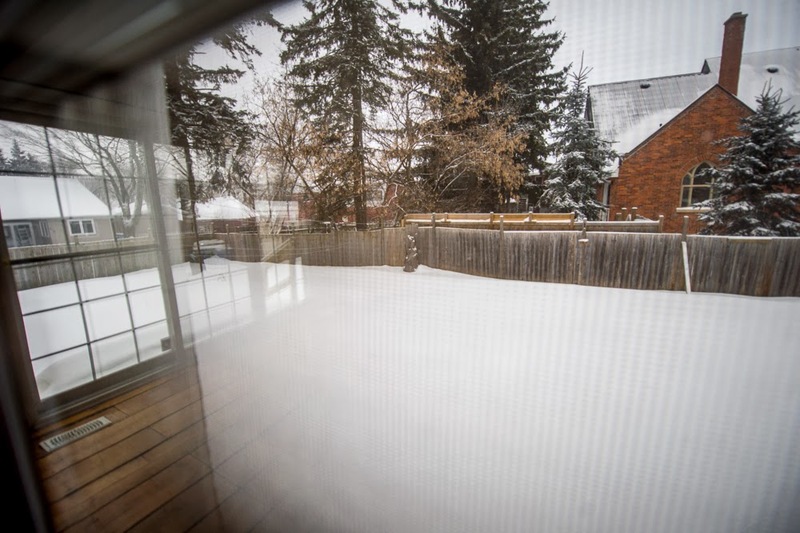 Here is our side yard - looking out the door with the doggy door. The dogs will have fun with this! Here is the backyard behind the home. 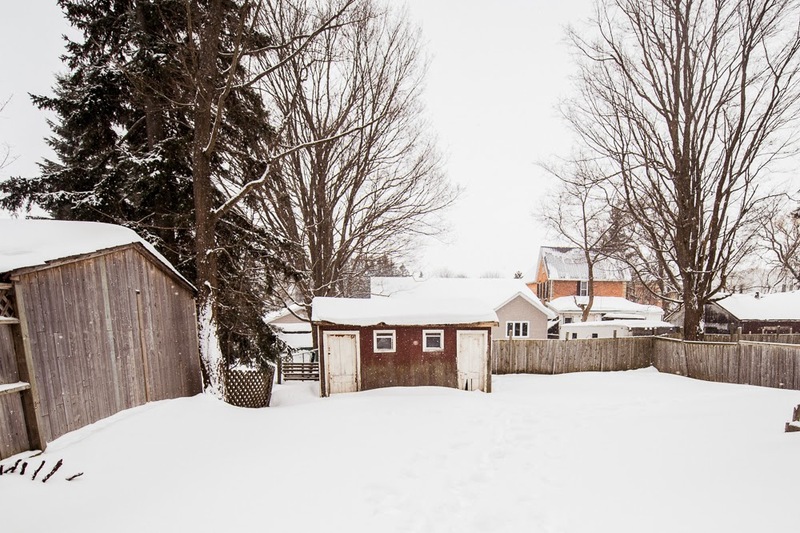 The sideyard is to the right and conveniently boasts perfect dimensions for a swimming pool ;) haha...someday. The other angle of the master. No closet...which is ironic because every other bedroom has a giant closet lol. 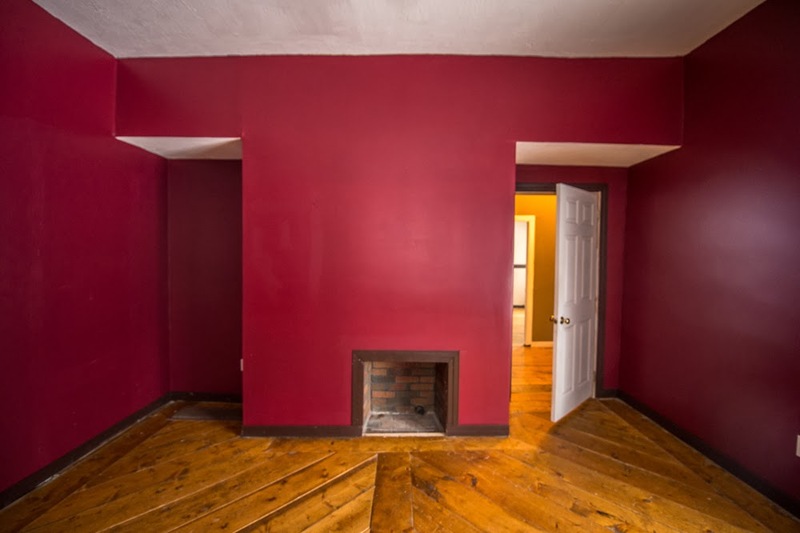 A happy discovery: this wall with the fireplace has been drywalled over but is originally brick! We are taking down that wall immediately. The other bedroom on our side of the second level. Has a walk-in closet. The stairs to the third story loft. 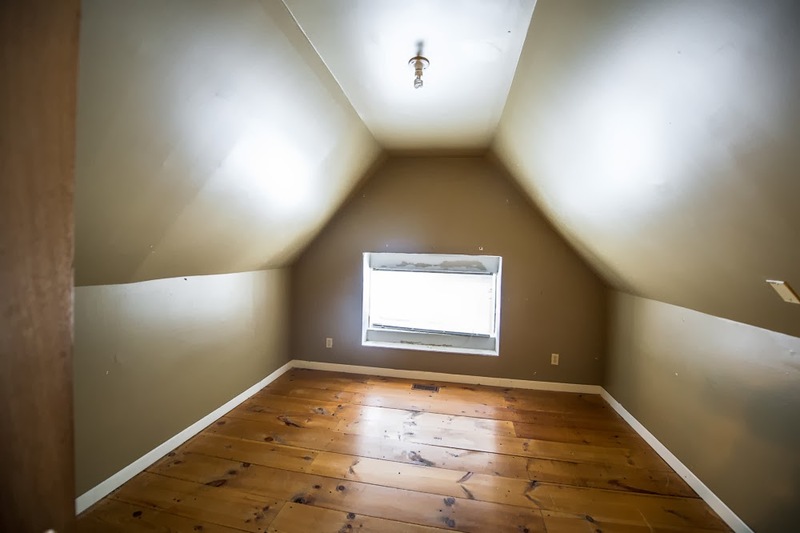 One of the 3 bedrooms upstairs. They look short but the ceilings are still pretty high. For now one will be lived in by Nathan who has lived with us now for almost 2 years, one will just be used for storage and one will be a yoga room. Now we are looking at 2nd storey apartment. 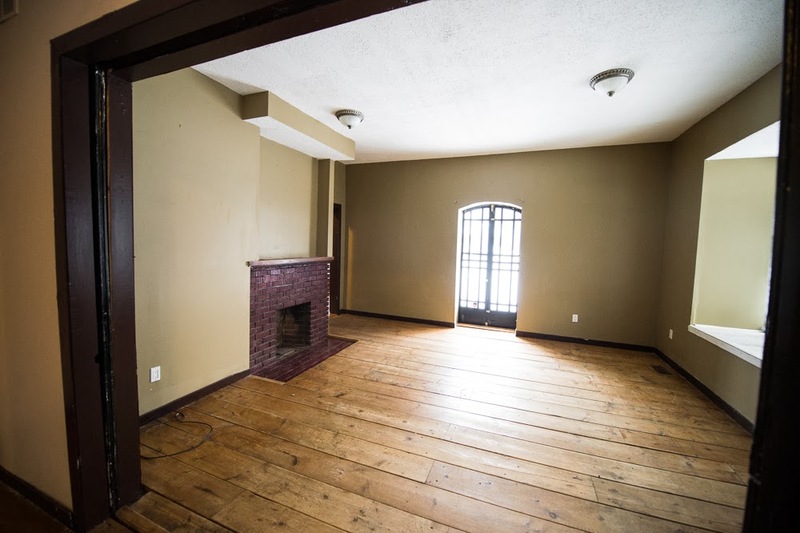 One day I would make this large room a rec room with a balcony (that door goes to nowhere) but for now it's a kitchen and a dividing wall for a dining room/livingroom for renters. It's a big apartment! Pretty cool. The bathrooms are hard to photograph because they are large but laid out so sporatically. 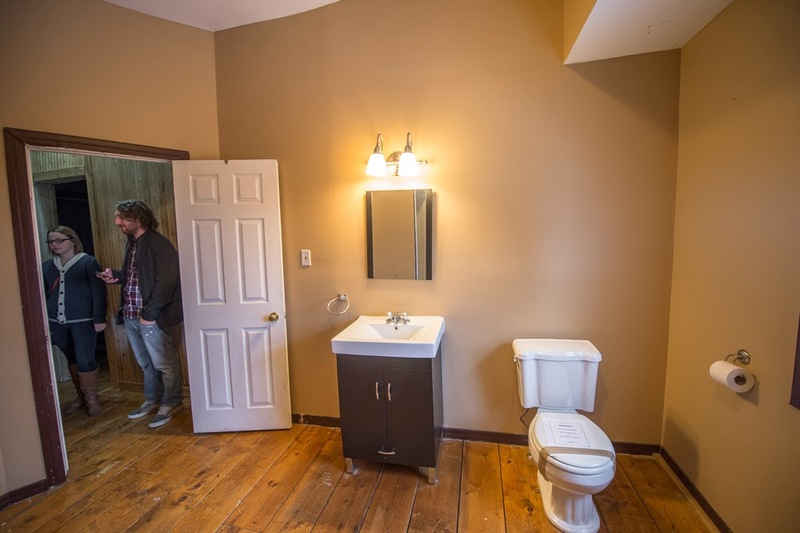 The below 2 photos are of the master bath but there is also a tub in there too. So that is the home tour for now! We have people asking us a lot of questions...if you have any please comment below and I will answer you! The basement has too low ceilings to be finished into anything else but it will serve as good storage (although it's creepy and I won't be going down there...lol). We dream of being able to entertain house guests and host backyard BBQs and all that fun stuff. 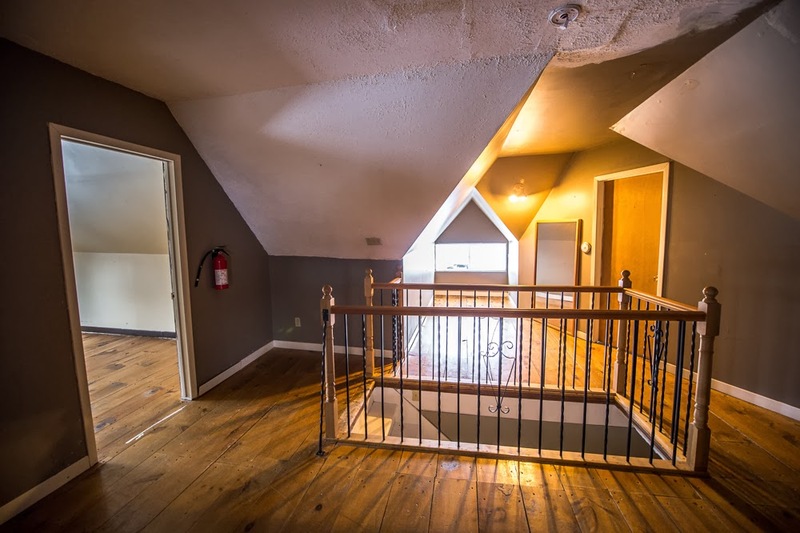 There are a million possibilities for the future...and buying this home and investing into fixing it up and making it beautiful is us saying YES to whatever the future holds for us. Most of the questions we get are a lot of WHY's. Why so far away? Why now? Why not in the city? etc. I think the difference for us from most young people is that we don't actually enjoy living in crowded buzzing cities. We love nature and small towns. We live in a city with so many amenities and on our days off we get out of here and drive to the middle of nowhere. That's just who we are. I'd prefer to read outside than go to the mall. Scott would prefer to adventure through a field or forest than go to the bar or to the movies. We have spent 8 years together now and we have really grown as "one" - and this is who we are! This is our common ground, this is what we love together. He loves music and I love photography but we have also discovered a place where we both meet in the middle and work as a team with the same level of excitement for something and it's great! And the practical response to "why not CLOSER to Barrie?" 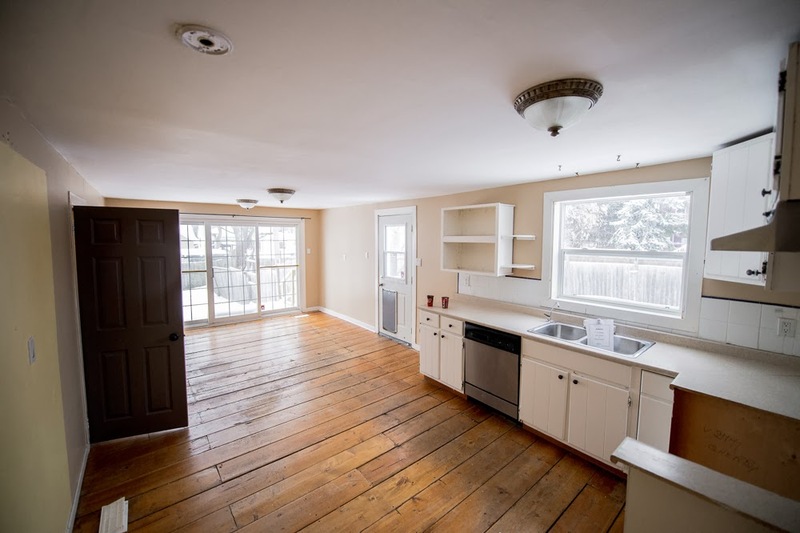 is simply that nothing was available in that area that was within our budget with the same level of potential we found in this home. Plain and simple.We looked at Oro but for another extra 25 minutes of driving, we were able to afford something that would have cost us at least double in Oro, and property taxes on this property would be INSANE closer to Barrie. As for the distance, we love driving together...it's pretty much our favourite pastime as a couple. So for us, the hour drive to Barrie for church and family/social visits or the 30 minute drive to Orangeville for shopping are NOT a big deal. By the time we are old enough that this could change, I am sure our area would be built up enough and our lives will have changed enough that we wouldn't be needing to go into the other cities as much. Until then, we are perfectly happy driving into town on free weekends and enjoying that time together. 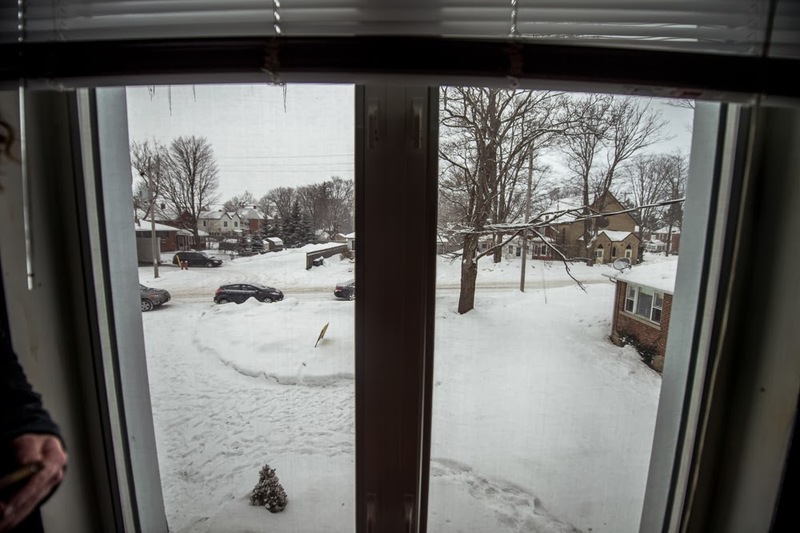 As for the bad winter weather, Barrie is nearly just as awful. I work from home in the winter, so it's not a concern for me...and Scott will not be taking risky drives if the weather is bad because in his line of work (building homes outside) they can't work in bad weather anyway. Okay well that's all I can think to say for now! Hope you've enjoyed reading this intro post and thanks for following along on our journey! 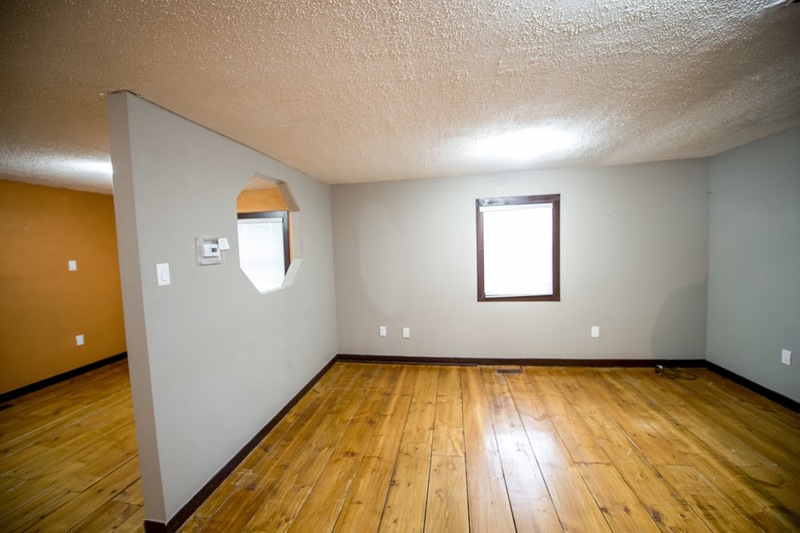 I will continue taking lots of photos and will post here when I can of our reno projects, furniture/decor finds, and lots of before/afters as things start coming along! I can see why you two fell in love with this house, Sam. So much potential! Looking forward to seeing more pictures! Also, the name is perfect! SAM it's so perfect!!! Congrats!! this is such a beautiful house! i showed your blog to a girl in my office, and i told her that i've never really had a 'dream house' but i think this might be it! congrats!